Above, Hannah Corney ’18 examines the condition of a tree. For 18 years, more than 100 undergraduate students have received funding from the John T. O’Connor ’78 Endowed Fund for Environmental Studies to participate in Clark University’s HERO (Human-Environment Regional Observatory) program. In HERO, students conduct research on local environmental issues, gaining skills and experience to help them achieve their post-college goals. Since 2012, HERO Fellows have monitored the health of trees replanted in the Worcester area after the invasion of the Asian longhorned beetle (ALB). The city had to remove 35,000 trees after it faced one of North America’s largest ALB infestations. 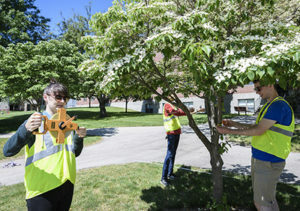 As data collected by HERO’s undergraduates show, the Worcester Tree Initiative (WTI) and state Department of Conservation and Recreation (DCR)’s program to replant 30,000 trees in residents’ yards has largely proven successful. 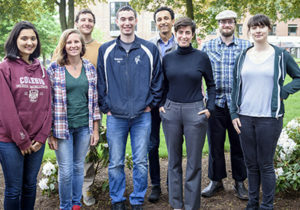 The HERO team of Clark and University of Massachusetts, Amherst, undergraduates, from left: Meyru Bhanti ’18, Hannah Corney ’18, Ben Breger of UMass, Eli Baldwin ’19, Miles-Philbert Weule Chandler ’18, Sonny Kremer of UMass, Joseph Mogel ’18 and Gemma Wilkens ’18. This year, the HERO program expanded the research goal to include cities that face a dearth of trees due to their industrial past: Holyoke, Chelsea and Revere. 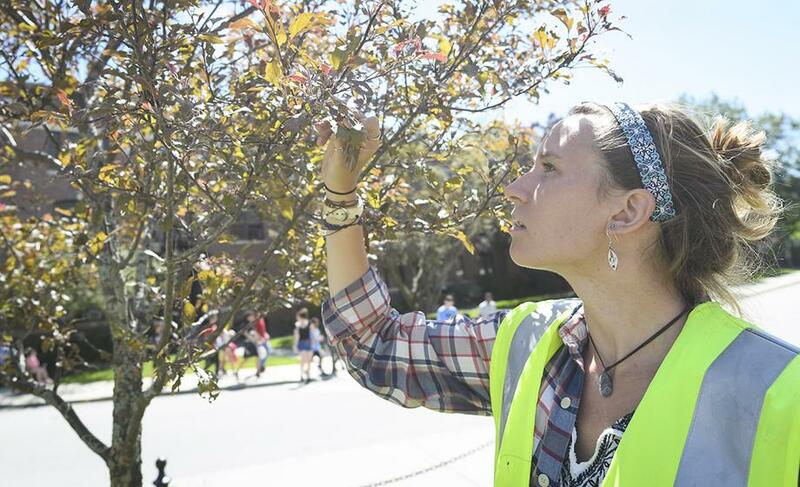 The cities are part of Massachusetts’ Greening the Gateway Cities Program, which aims to increase tree canopy by 10 percent in high-density neighborhoods in 26 former factory towns by providing trees to residents and planting trees along city streets. “They saw the success of Worcester and thought that they could bring these benefits to other places in the commonwealth,” HERO Fellow and geography major Miles-Philbert Weule Chandler ’18 told the Worcester Telegram & Gazette. The gateway cities suffer from the “urban heat island effect,” where temperatures can range from 20 to 50 degrees Fahrenheit higher compared to surrounding areas with more vegetation and less human activity, explained Meyru Bhanti ’18, a geography and environmental science major. “This can be especially dangerous for vulnerable communities, the elderly and those living in older housing stock,” Bhanti said. Planting trees can mitigate these effects, as well as curb energy costs, increase air quality, provide more privacy, improve aesthetics and foster a sense of community. For eight weeks, Weule Chandler and Bhanti worked with their cohort of HERO Fellows: geography major Eli Baldwin’19; global environmental studies major Hannah Corney ’18; economics major Gemma Wilkens ’18; and mathematics and history major Joseph Mogel ’18. Three Clark geographers served as research assistants: Arthur Elmes, who is to receive his Ph.D. in August; Marc Healy, a doctoral student; and Zhiwen Zhu, a student in the Master’s in Geographic Information Science for Development and Environment (GISDE) program. a tree on the Clark campus to show how they check the health of trees in the gateway cities. The students measured and assessed the condition of trees planted along city streets and in residents’ yards. In Chelsea, they interviewed residents who had received trees. On July 13, they presented their findings to an audience of research partners from the WTI, DCR and U.S. Department of Agriculture (watch a video of the presentation). The DCR will use the students’ data to modify their tree planting programs in other gateway cities. In their survey of 1,388 trees in the three cities, students found that 81 percent overall had survived. Cherry plum, eastern redbud, crabapple, white oak and honey locust fared well; black gum, tulip trees, dawn redwood, cherry dogwood and dogwood did not. The HERO program allows undergraduates to apply what they’ve learned in the classroom and reviewed in research journals to an initiative that could affect the health of thousands of trees – and people. “There’s a lot of research about trees improving people’s overall wellbeing,” Weule Chandler said. The summer experience, he said, has given him more insight into his research interest: environmental justice issues, particularly among indigenous people. It also helped him learn more about how to conduct research. “I really appreciated collecting the data and having that stage of analysis afterward because oftentimes, you’re reading research that has already been produced. It was a very eye-opening experience to go from the ground up,” he said. The HERO Fellows will spend the 2017-18 academic year working on individual research projects. They will present their research next spring at Clark’s Academic Spree Day and at the American Association of Geographers’ annual meeting in New Orleans. “This year’s HERO Program was even more ambitious than previous years because of the number of people, resources and travel involved,” said John Rogan, professor in the Graduate School of Geography who oversees the program with Deborah Martin, the school’s director. For the first time, the program collaborated with the University of Massachusetts at Amherst. Theodore S. Eisenman, assistant professor of landscape architecture at UMass, and two of his students, Madison “Sonny” Kremer and Ben Breger, joined the Clark team to examine trees and interview residents in Holyoke. In addition, HERO students met with Lara Roman, a research ecologist with the U.S. Forest Service’s Northern Research Station in Philadelphia and an expert in urban tree mortality and the effects of replanting programs nationwide. She shared the latest information and worked with the students to develop methods for assessing tree health.